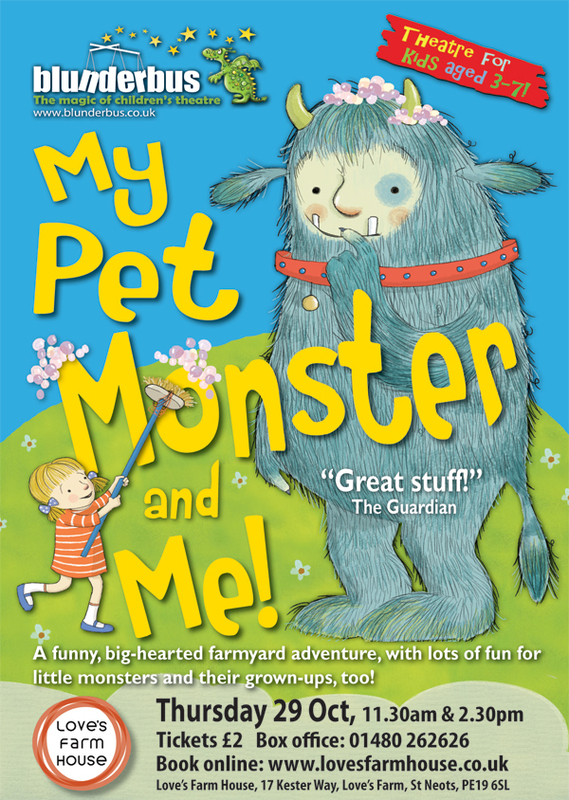 Join us down on the farm for adventures with Sophie and her new friend George, the most lovable baby monster in the land! But when a little monster just keeps on GROWING, there’s big trouble ahead! With puppetry, music and songs, this hilarious new show promises plenty of laughs for kids aged 3-7 and their grown ups. We’re hosting two performances of this magical theatre performance at Love’s Farm House on Thursday 29 October at 11:30am and 2:30pm. Tickets costs £2 per person (a subsidised price as part of our launch celebrations). Babies on laps are free. Update… just a few tickets remaining for 2:30pm only. Please call 01480 262626 or email bookings@lovesfarmhouse.co.uk to arrange collection in person. Love’s Farm House will open its doors in October with a week of celebrations. We start on Saturday 24th October 2015 at 4pm with the Love’s Farm Expo. It’s your chance to see the building, meet the people who will be hosting activities and find out about all the projects LFCA is running across Love’s Farm. There’ll be craft activities, a barbecue, face painting and we’ll be burying a time capsule in the garden. From 6:30pm there’ll be live music, the LFCA Community Champion Awards, a barn dance and disco, so wear your dancing shoes! On Sunday 25th at 2pm we’ll be screening Big Hero 6, an action-packed comedy-adventure from the team behind Frozen and Wreck-It Ralph. This will be free to attend as part of launch celebrations. There will be free taster classes throughout the week, showcasing activities that will be available at Love’s Farm House. On Monday we have Hartbeeps and Yoga. Tuesday is Baby Sensory and the Love’s Farm Youth Club. Wednesday will be the first of our coffee mornings in the foyer, plus more Yoga and Little Starlings under-5s drop in. My Pet Monster and Me! Brought to life by acclaimed Blunderbus Theatre, this show is especially for little monsters aged 3-7 and their grown-ups. Performances are at 11:30am and 2:30pm. Tickets are £2 and will be available shortly. On Friday morning St Neots Library brings Baby and Toddler Rhymetime to Love’s Farm. Later that day we have a Burlesque Fitness free taster class, and the LFCA Love’s Farm Quiz takes up its new residency at the Farm House Bar, which will be open every Friday evening. On Saturday morning there are taster Street Dance classes for 4-6 and 7-10 year olds. And on Saturday evening we round up our launch week with a Family Halloween Disco. Tickets cost £1 and will be available throughout launch week. Start planning your costumes now! We’ll be open for business as usual from Monday 2 November – full calendar of events coming soon. Get in touch at bookings@lovesfarmhouse.co.uk to enquire about private hire for parties.